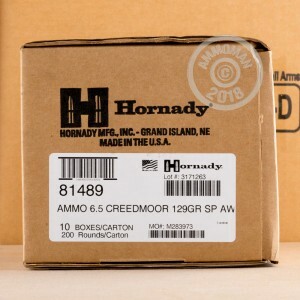 Compliment your custom 6.5mm Creedmoor with ammunition that is just as precise. Hornady crafts this cartridge using a non-corrosive Boxer primer which is fitted to a reloadable brass casing. The case is filled with clean-burning propellant grains which cut down on fouling and promote more consistent chamber pressures and muzzle velocities with every shot. 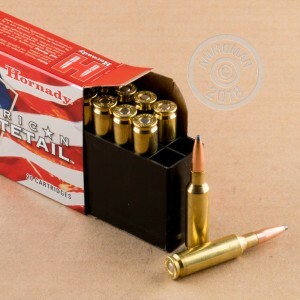 Hornady tops of this American Whitetail load with a 129-grain InterLock projectile which has a toothed cannelure at its crimp point which serves to prevent setback, preclude malfunctions, and offer the best accuracy available. The InterLock bullet also has a lead tip which is contoured to match its jacketed ogive for aerodynamic flight. Hornady designed this projectile with an internal band at its base which locks the jacket to bullet's lead core for momentum preservation. As the bullet expands in a deer or hog, the band and cannelure keep separation from occurring which ensures that the bullet will successfully reach the vital organs and deliver devastating kinetic energy. Hornady is an American business with experience dating back to 1949. 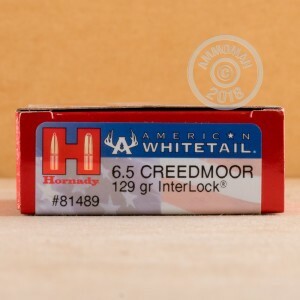 Their finished ammo products like American Whitetail allow shooters to enjoy the quality of their innovative projectiles without the trouble of handloading.